Boomer Brands is a sunny, nostalgic showcase of some of the beloved toys, foods, television shows, and consumer goods that formed such a huge part of that generation’s youthful memories. A former brand marketer, Barry Silverstein decodes how advertisers shrewdly analyzed the postwar “demographic earthquake of kids” and saturated the influential new medium of television to promote their products. 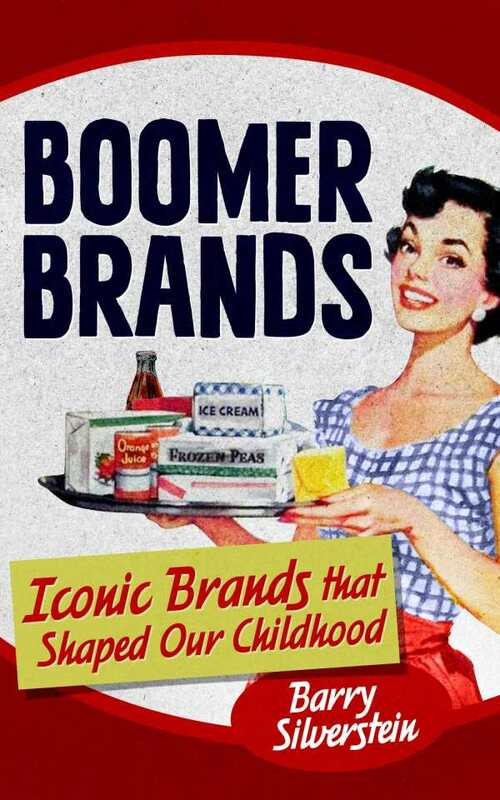 The book provides a memory-filled history of how items were developed and strategically marketed, including the reasons why boomers have such a strong emotional attachment to their favorite brands. Punchy historical overviews introduce each subject chapter, followed by lists of representative brands, lists of reference sources, and a sprinkling of illustrated one-page biographies of specific brands. Silverstein’s jocular, conversational prose is further enlivened with his own fond remembrances of favorite candies, dining at Howard Johnson’s restaurants, and playing wiffle ball. He engagingly punctuates each chapter with a question back to readers about their own brand preferences. It’s a repetitive but effective style for a book specifically designed for a baby boomer audience. The book is intriguing as it explores how other aspects of boomer culture can be construed as brands. A chapter about rock-and-roll labels, artists, and subgenres examines how closely they were imprinted on boomers’ youthful identities, alongside convincing arguments that the diverse political movements and environmentalism of the 1960s and ’70s can be considered philosophical brands embedded in the idealistic consciousness of the huge boomer demographic. A boomer himself, Silverstein has reverent affection for some of his favorite childhood brands (he is still in love with all things Disney), though he also is cognizant that many of his beloved junk food treats were merely “salt-infested snacks” and “nutritionally bankrupt wonders.” Other criticisms are laced through with a light hand, and the book is described (one might say branded) as a fun and nostalgic “stroll down memory lane” by a self-proclaimed brand maven. However, Boomer Brands can also be read as a short history of hard-sell marketing to youngsters. Silverstein only touches on the darker side of brand marketing on impressionable young minds, but certainly we are well aware today that advertisers could initially flood children’s programming with an enticing commercial barrage for fizzy drinks, sugary snacks, toys, personal care products, and other consumer goods. While some of these brands might have been welcomed by indulgent or harried parents, it’s hard not to look back with hindsight at how the seeds of hyperconsumerism, obesity, later-in-life diabetes, cancer, and other physical and mental health dangers were planted through unregulated advertising directed at vulnerable boomer children. Boomer Brands is an informative and lighthearted peek back at the way Madison Avenue created a huge and enduring market for many iconic consumer products and social trends.